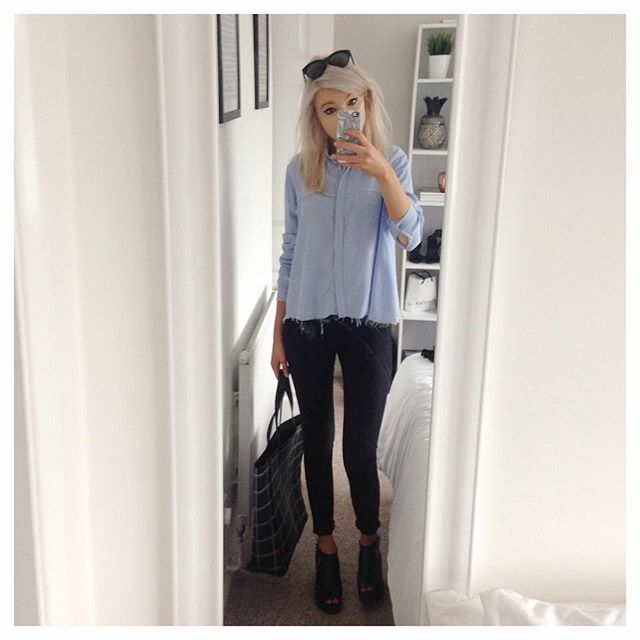 Shirt, Topshop. Jeans, bag & shoes, New Look. So I have not outfit posted in a while and now I have come back with shorter hair. What do you guys think? I kinda love it this length - it doesn't get in the way so much! This was my outfit today when I popped down to London with the fam - but I shall do a insta / life round up in a post coming soon. I have always loved blue shirt looks - I have pinterested some looks like this lately. This look would have also looked good with ripped jeans. What I like about this shirt is that it is not so prim and proper. It has some fraying and kinda looks very well worn which I like. A lovely meal with the fam, pimms in the sun. Safe to say I had an enjoyable Sunday. Such a simple look, yet so effective. I agree, the fraying on the shirt takes the pretty vibe totally out of the look. Love the hair, I recently cut 8 inches of mine and I absolutely love it. Love your hair that length and such a lovely look!